Every candy store “SHOULD AND MUST HAVE” these five items to be successful! Your Return on Investment (ROI) is highest when you have these tools in your location. What are your top concerns as a store-owner? How to bring customers in? How do I maximize profits? How do I make the most out of my retail space? These five “MUST HAVES” are the answers to those questions and so much more! They allow you to display, sell, and stock the merchandise that keeps customers coming back for more. 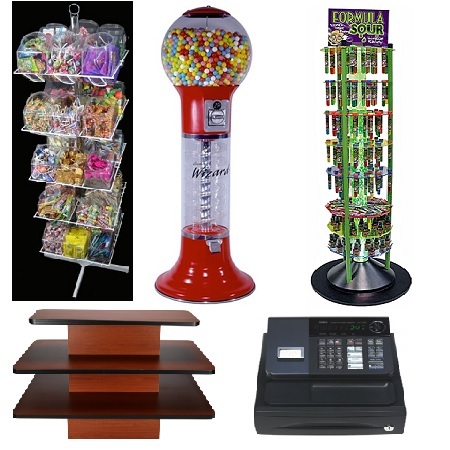 The pre-filled 30 bucket rack, the gumball machines and the Formula Sour Bubble Display offer an enormous ROI. The eye-catching displays have small footprints, allowing you to make the most of your floor space! Save 10% on all 5 items at checkout! Gumballs cost 4¢ to 5¢ a piece and sell for 25¢! Kids love watching the gumball roll down to their waiting hands!